Please don’t get me wong, but sum ting wong in America. 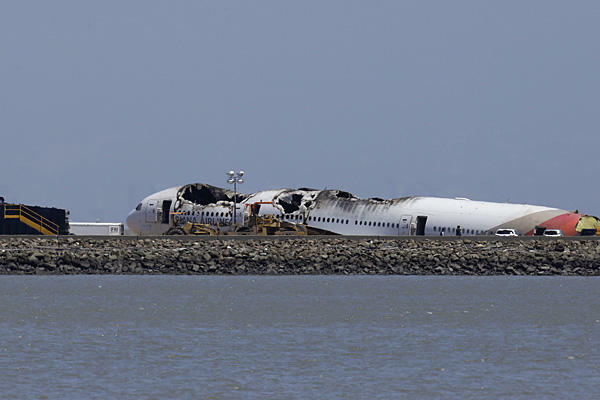 Eleven days ago, July 6, 2013, a miraculous belly-landing of an Asiana Airline flight in San Francisco was seen on video by millions of viewers. A few died, dozens were injured, many seriously, and folks around the world got a stark reminder that traveling 500 miles an hour 30,000 feet above the ground carries some risk. Today’s air travel with danger is an integral part of modern life. This equally tragic danger is replicated in millions of car accidents every year, spreading death and despair widely among the population. To the relief of most, we are watching safely from a distance, rather than experiencing the event personally. Placing oneself emotionally inside the plane as it is shown is a trying experience. As quick as you can say Jack Robinson, the NTSB is on the job in San Francisco to find out what happened and why. Ten days later from Oakland’s KTVU the names of Asiana’s four pilots, who steered the plane to its final resting place, are confirmed from the NTSB’s Washington office. In decisive action, the NTSB discovers and announces that the fictitious names are the work-product of one of their summer interns in Washington D.C. He is immediately dismissed from his employment for 1) answering the phone, 2) making light of a near tragedy 3,000 miles away, 3) being racially insensitive, and 4) having a sense of humor that is simultaneously graphic, empathic, job-relevant, and emotionally out of sync with grieving. Such creativity can certainly not be tolerated in our nation’s capitol. When sum ting wong in Washington, the NTSB is able to identify the alleged perpetrator within 24 hours, presumably get the goods on him, and send him packing. In the IRS we are unable to get the goods on anybody after months of “investigations”. When “rogue employees” are fingered in Cincinnati, their bosses in DC take the fifth in testimony and remain on the federal payroll forever, if not promoted to a higher pay-grade. After the death of Benghazi Embassy employees, our esteemed and most trusted Secretary of State says: “At this point, what difference does it make?” Sensitive! Really sensitive!! Sum ting wong in America? Many tings wong in America. Les fix dem. Won ting wong is the Dems!! Di Reps not much betta.